Well after what seemed like a mammoth train journey (3 changes on the way there but oddly only needed one on the way back - moral of the story is to completley ignore online journey planners! ), I am home tired and exhausted but had an amazing time. 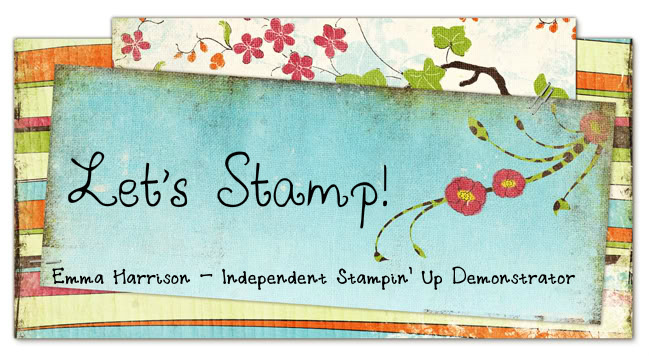 This was the second European Stampin' Up! Convention, and the first one that I attended, and it was such a fun time. I love meeting fellow demos and sharing ideas and being inspired by others. Not only was it great meeting all the wonderful demos from the UK, Germany and France but Shelli (the founder of SU) herself was there, and you could not meet a nicer lady! Her enthusiasm is totally contagious! Ohh, and we got lots of lovely free stamps - one of the perks of being a demo! There are so many exciting things in the pipeline, some of which have to remain a secret for a little while longer but if you keep an eye on my blog I'll try and post some photos of the amazing make & takes that we made and the swaps that I received from fellow demos. And if you're thinking of signing up to become a demo, you'll be very excited to hear that next year's convention is going to be in ... Disneyland Paris!!! I can't wait. Great photo above Emma, That should be the one for this blog on the right now x Lovely blog by the way. Hi Emma! Thank you so much for coming to my blog and visiting me! You asked me what I used to color that LOTV image and it was with distressed inks. The color was Aged Mahagony with Black Soot for the deep shading. I hope this helps!